The external pylons are designed for the Magneti Marell Checkstar Authorized Workshops that have a vast area outside and a good location at their disposal. 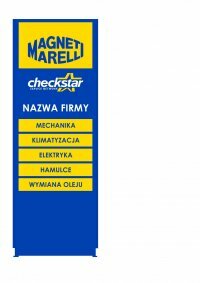 The external totems provide a clear and prestigious designation of a Magneti Marelli Checkstar Authorized Workshop. They have a space to enter your company name and specialization.